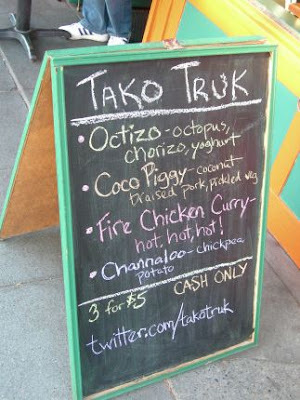 Fanatic followers of Tako Truk, the short-lived street-food experiment known for its tako (octopus) and the lack of a truck (its stationary home was a walk-up window at Eastlake’s 14 Carrot Cafe), will be cheered to know this: co-owners Cormac Mahoney and Bryan Jarr plan to move into the recently shuttered Sostanza. But sorry, gang. It won’t be another Tako Truk. No longer Truk’n on Eastlake, but more to come from the owners, elsewhere. “We’re still finalizing the deal phase, but it’s close-close,” Jarr said yesterday, describing the dual-level trattoria at the tail-end of Madison Park. 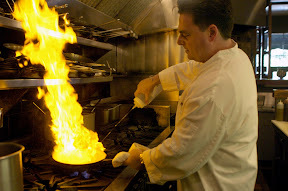 “We hope to take over by the end of the month.” Once in, he says, they’ll begin a remodel, which according to Sostanza’s owner/chef Lorenzo Cianciusi, will involve the reconfiguration of the upstairs bar and the installation of a communal table. 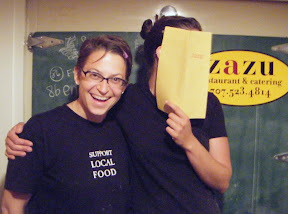 Lorenzo Cianciusi (left) throwing a frying pan around at Sostanza (photo by Heather Trimm) and Zoi Antonitsas (far right, in Santa Rosa with Zazu’s Duskie Estes), hiding behind the menu back in her Top Chef-phase. Soon enough, we hear, Zoi will be throwing a frying pan around in the more refined confines of Madison Park with Mahoney. Communal table? 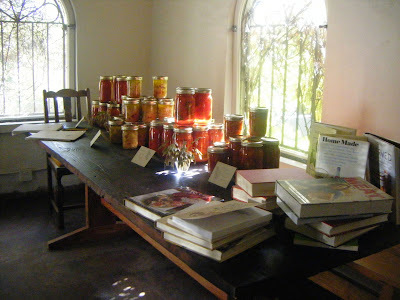 Madison Park Conserve-atory? Affiliation with Sitka & Spruce? We’ll see!